The Internet is not US-centric! 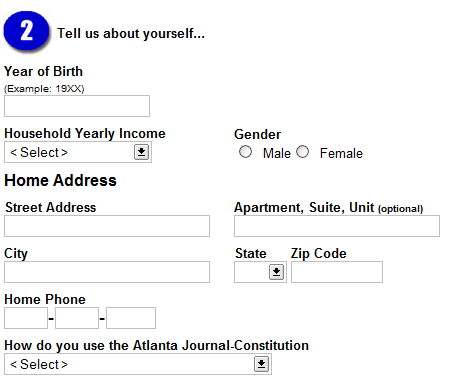 I had considered sending a link to the Atlanta Journal-Constitution’s “Vent” column to some Canadian LiveJournal users, but as I looked at the AJC’s ridiculously intrusive mandatory registration, I realized that its intrusiveness (which I’ve discussed at length before) is not its only fault. Notice anything missing? Like, say, an option to select what country you live in? Well, that’s not a good start… just because your paper is published in the US doesn’t mean all your potential readers live there. Heck, when there’s a weekly section titled “Atlanta & the World”, it might be a good idea to, I don’t know, make your site accessible to the whole world. And it’s even worse for Aussies and Brits; in addition to the postal code and state problem (yes, I know, Australia has states, but none of them are listed in the drop-down menu! ), the form only accepts ten-digit phone numbers as well. Thank you for contacting The Atlanta Journal Constitution. We appreciate your interest in our paper and embrace the opportunity to better serve our valued customers. We understand that you have been unable to complete the registration process due to a foreign zip code error. We apologize for the inconvenience. Please complete your registration by entering the state of GA and using “44444” in the zip code field and submit. You may also use 444-444-4444 as the phone number. Once you have confirmed your registration, you will have full access to ajc.com online. Again, we apologize for this inconvenience. The main reason it’s been busy is that Thursday through Saturday, I was in Spartanburg, SC for the CCSC Southeastern Regional Conference, visiting a few of the seminars and participating in the programming competition on Saturday. Mercer Team A, the team I’m on, ended up placing first at the competition, having submitted correct solutions for four of the six problems with at least some amount of code written for the remaining two.